The 2010 Santa's Armoire Ornament is the event piece for the 2010 Artists on Tour events. Available for purchase at the 16 event locations around the United States. VERY LIMITED QUANTITIES AVAILABLE, quickly selling out at each event. Purchasing one at an event involves standing in line for hours prior to the opening of the store. 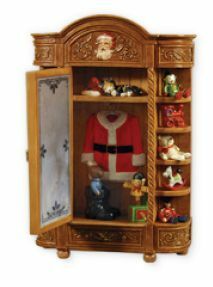 The armoire is HIGHLY DETAILED with a hinged door that opens to reveal Santa's Suite, cap and a few toys. Ten additional toys line the shelves on the outside of the armoire. A tiny mouse sits atop the armoire out of site from the front.